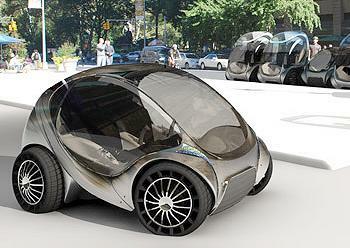 CAMBRIDGE, Massachusetts, February 7, 2012 (ENS) – A foldable electric CityCar has been created at the Massachusetts Institute of Technology’s Media Lab and commercialized by a consortium of automotive suppliers in Spain’s Basque region. Since 2009, the Media Lab has collaborated with Denokinn, the Basque Center for innovation, entrepreneurship and new business, from Vitoria, Spain, and their partner companies to refine the design and technology of the CityCar ahead of its commercialization. 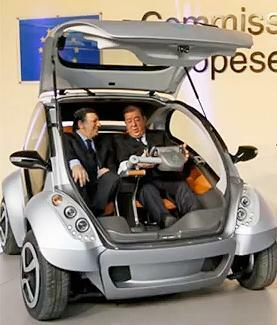 The MIT Media Lab foldable electric CityCar was unveiled at European Commission headquarters in Brussels on January 24. The consortium is negotiating to place a fleet of 100 CityCars in Brussels next year. Branded Hiriko, which means urban in the Basque language, these two-passenger micro cars are just two meters (6.5 feet) long and weigh 450 kilos (1,100 pounds). The passenger cabin can slide upwards as the wheels roll together, folding the chassis to minimize the car’s footprint when parked. When folded, three CityCars can fit into one traditional parking space, making parking much more efficient in crowded cities. The Hiriko’s electric motors are in the wheels, called Robot Wheels. Each Robot Wheel can be independently controlled, allowing the CityCar to execute tight maneuvers such as spinning on its own axis to achieve what MIT calls an “O-turn.” The Robot Wheel modules are controlled electronically using by-wire systems made popular by the aerospace industry. The CityCar runs on two rechargeable lithium-ion batteries with a range of 120 kilometers (74 miles). Its top speed is curbed electronically to comply with speed limits in city centers. Several cities have shown interest in the CityCar – Barcelona, Berlin, Hong Kong, San Francisco, Malmö in Sweden, Quito and the Galapagos Islands in Ecuador and Vitoria-Gasteiz, the second largest city in the Basque region. Talks are in progress with Paris, London, Amsterdam, Geneva, Boston, Dubai, Abu Dhabi and Brussels. Each member of the Basque consortium is responsible for producing one of the modules that makes up the CityCar. Production assembly lines would be created in deprived areas of the cities that decide to accept the unique vehicles. 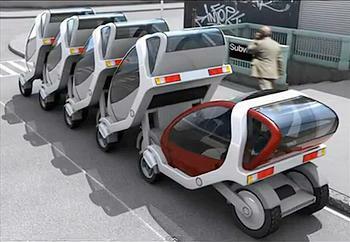 Private citizens as well as cities will be able to purchase the folding cars at prices around 12,500 euros (US$16,600). Conceived by a team of MIT students led by the late Professor William J. Mitchell (1944-2010), the CityCar project is part of larger initiative at the MIT Media Lab devoted to investigating urban mobility systems. Professor Mitchell’s Smart Cities research group at the MIT Media Lab (2003-2010) designed the CityCar to take on the biggest issues facing cities – congestion, inefficient use of energy and land, air and noise pollution, and carbon emissions leading to global warming. The CityCar designer is William Lark, Jr., a PhD student who worked in Mitchell’s Smart Cities group. In developing these concepts the Smart Cities research group employed anti-disciplinary research teams, a tradition formed at the Media Lab. The design team consisted of architects, mechanical engineers, electrical engineers, computer scientists, urban planners, operations researchers, neurologists, sociologists and economists. electric-assist bicycle called the GreenWheel. In addition to the CityCar, the Smart Cities team has designed a folding electric motor scooter called the RoboScooter, and an electrically assisted bicycle, the GreenWheel. The GreenWheel integrates lithium-ion batteries with electric motors into a small modular hub unit that could be retrofitted on any standard bicycle. Together with the CityCar, the RoboScooter and GreenWheel create a Mobility-on-Demand ecosystem of lightweight and low-energy EVs, allowing users to select the appropriate vehicle for each trip segment. MIT says the CityCar and the other lightweight EVs are designed to be shared. By deploying CityCars at charging points throughout a metropolitan area, any user of the system can walk up, swipe an access card, pick up a vehicle, and drive it to any other charging point. Mobility-on-Demand systems address what transportation planners call the “first mile, last mile” problem of mass transit systems, by providing mobility near or at a user’s origin and final destination – creating a intermodal network that is complementary and synergistic to transit systems. The research on urban mobility conducted by the Smart Cities group resulted in the publication of a book Professor Mitchell wrote with two top research executives from General Motors, Chris Borroni-Bird and Lawrence Burns. “Reinventing the Automobile: Personal Urban Mobility for the 21st Century,” is published by MIT Press.